When your child tucks into a school meal you can be assured a lot of thought has gone into making it as healthy as possible. We only provide food that is fresh, prepared daily and which provides everything your child needs to feed their bodies and their minds without compromising quality and choice. Therefore, we have put into place the ingredients that make our school meals service one you can trust – from preparation to plate. 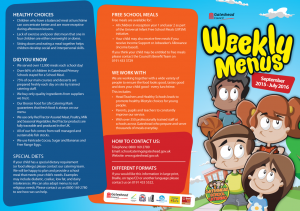 To view the weekly menus for September 2015 to July 2016.